MANILA – The Professional Regulation Commission (PRC) announced Friday that 919 out of 1,595 passed the Architect Licensure Examination. 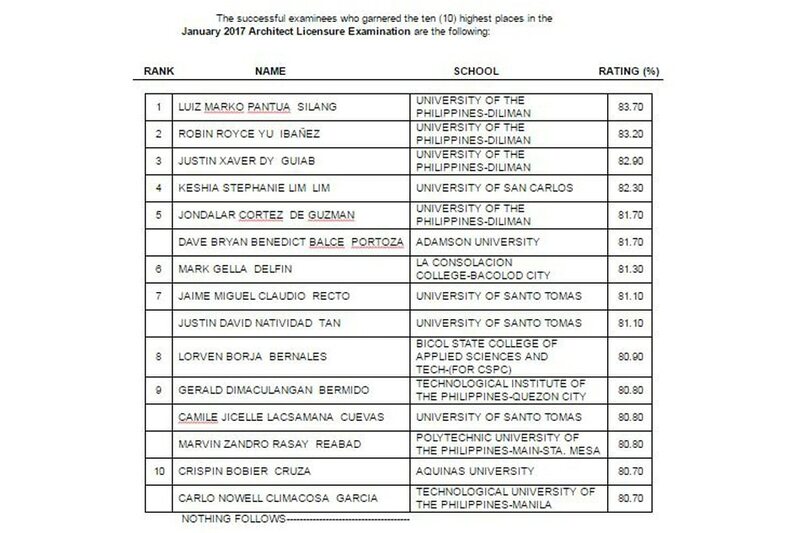 University of the Philippines-Diliman graduate Luiz Marko Silang topped the exams with a score of 83.70 percent. Meanwhile, the University of Santo Tomas (UST) was declared as the top performing school after 112 of its 137 examinees passed the exam. From February 13 to February 17, 2017, registration for the issuance of Professional Identification Card (ID) and Certificate of Registration will be done on-line. Board passers must visit www.prc.gov.ph for the initial registration. Those who will register are required to bring the following: Notice of admission, duly accomplished Oath Form or Panunumpa ng Propesyonal, 2 pieces passport size pictures (colored with white background and complete name tag) and 2 sets of documentary stamps. Successful examinees should personally register and sign in the Roster of Registered Professionals. The date and venue for the mass oathtaking of the successful examinees have yet to be announced.